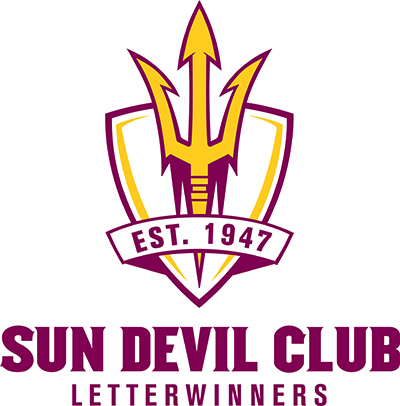 Sun Devil Letterwinners program is a part of the Sun Devil Club and provides former Arizona State varsity student-athletes the opportunity to maintain a lifelong connection with Sun Devil Athletics. We are an exclusive group of former athletes who understand the commitment and spirit that it takes to be called Sun Devil athletes. Because of your participation and achievements as a student-athlete, you will forever be a part of the great legacy of Sun Devil Athletics. Join your fellow former Sun Devil student-athletes in supporting the growth and success of Sun Devil Athletics. Our mission is to create an atmosphere and culture whereby former ASU student-athletes promote Sun Devil Athletics through Sun Devil Letterwinners. We will promote and honor the contributions made by former Sun Devil athletes. We also strive to provide our members with the opportunity to foster and maintain relationships across different sports and generations. Through a strong and active membership, we aim to make a significant difference in the lives of our current and former student-athletes. Sun Devil Letterwinners program exists to provide former Sun Devil athletes the opportunity to maintain a lifelong connection with Sun Devil Athletics. Our purpose is to serve as both a fundraising organization under the umbrella of the Sun Devil Club, as well as a networking form for the enrichment of alumni and current student- athletes. We provide financial support to ensure a successful and competitive future for Sun Devil Athletics. Sun Devil Letterwinners will develop into a strong active organization with significant influence through financial and philanthropic support. The program will add value to the college experience in the lives of our current student-athletes, and also serve as a resource for all of our former student-athletes. For more information, please contact Kevin Miniefield at 480.727.6644 or by email at Kevin.Miniefield@asu.edu.